Heather Watson has pulled out of the ASB Classic, the WTA season opener in Auckland, due to a sprained ankle. The British number three and world number 92 expects her next tournament to be the Moorilla International in Hobart before entering her first Australian Open main draw on January 16th. There’s something about Kim Clijsters that I just love. In the third year of the Diamond Games exhibition event in her native Belgium she showed me exactly why I’m so fond of her; producing more classic viral moments than the OMG Cat with the help of sister Elke, fellow Belgian Yanina Wickmayer and current world number one Caroline Wozniacki. Know any exhibition moments to top this? Comment and share your favourites! James Duckworth has been given a wildcard place at his home Grand Slam the Australian Open. The 19-year-old had reached the final of the Aussie Open play-offs but lost in straight sets to Marinko Matosevic. As preparation, Duckworth will enter the qualifying events at Brisbane and Sydney leading up to the first major of the year in Melbourne. Top seed Dominic Thiem cruised to his third consecutive junior title having only lost one game in the Orange Bowl final to fellow countryman Patrick Ofner. The Austrian headed into the clay court tournament at the Frank Veltri Tennis Center in Florida on the back of Yucatan Cup and Eddie Herr crowns and has now gone 18 matches unbeaten. Coincidentally, Thiem produced the same 6-1, 6-0 scoreline when he defeated Ofner in last Sunday’s Eddie Herr final. It could have been even more embarrassing for the seventh seed as he found himself 5-0 behind early on in the match. He salvaged some pride by getting on the scoreboard but Thiem’s dominance continued and, after a small rain delay, the world number eight won every game from then on. Thiem joins illustrious names such as Roger Federer, Bjorn Borg, John McEnroe and Ivan Lendl who have lifted the under-18’s title in the past. It wasn’t quite the perfect day for Thiem though. Himself and Germany’s Robin Kern were beaten 6-4, 6-3 by British pair Liam Broady and Joshua Ward-Hibbert in the boys’ doubles final. Anett Kontaveit inflicted revenge on Yulia Putintseva following her quarter-final defeat at the Eddie Herr International last week by dominating the Orange Bowl final and emerging a 6-2, 6-2 winner. It’s the 15-year-old’s second junior title of the year after her success at the ITF/LTAT Junior Championships in March and her first at Grade A level. The Estonian overcame a lengthy delay to proceedings at 1-1 in the second set to see out the match against the Russian favourite, who had been enjoying a healthy unbeaten run herself. Second seed Putintseva had looked to be getting back in it when she took an extended bathroom break at the start of the second set. She re-emerged to break her fifth seeded opponent to love but her revival didn’t last and she showed her normal aggravation towards the result by smashing her racquet at the end. Elsewhere, the USA missed out on the chance of a home champion in 2011 when the all-American duo of Jennifer Brady and Kendal Woodard lost 6-3, 7-6 (7-3) to Russian Victoria Kan and Ukrainian Ganna Poznikhirenko in the girls’ doubles final. Austrian pair Dominic Thiem and Patrick Ofner will square up for the second Sunday in a row with Yulia Putintseva and Anett Kontaveit contesting the other final at the 2011 Orange Bowl. Top seed Thiem comprehensively beat Ofner at the Eddie Herr International last weekend and has since extended his unbeaten run to 17 matches having conquered 12th seed Yoshihito Nishioka 7-6 (7-3), 6-3 in the Orange Bowl semi-finals. Seventh seed Ofner had a much trickier encounter with Canada’s Filip Peliwo. The 18-year-old lost the first set 6-3 before levelling things with a 6-4 second set score against his unseeded opponent. Peliwo had chances to win the match when he served at 5-4 in the decider but was broken and a tiebreak ensued. Ofner led 4-1 and 5-3 before being pegged back to 5-5 but won the next two games to reach his fifth final of the year. It will be the fourth meeting between the Austrian duo in their young careers. All of their matches have been on clay and they are currently tied with two wins apiece. Putintseva will also return to her second consecutive Sunday final as the reigning Eddie Herr champion takes on her quarter-final opponent from last week. The second seeded Russian was involved in a typically aural performance to knock out the last remaining American Sachia Vickery. She took the first set 7-5 and then came back from 5-1 down in the second to win by the same scoreline. Vickery had set point when serving at 5-3 but couldn’t keep her cool as the overzealous shouts from Putintseva led to increasing frustration. The wildcard had a penalty point go against her for racquet abuse and no handshakes were exchanged between the pair at the end. Hoping to inflict revenge on Putintseva will be Estonia’s Kontaveit who came through her semi-final against top seed Eugenie Bouchard following the Canadian’s third set retirement. The fifth seed blamed tiredness for her first set bagel but made a good recovery before the match came to an early end at 0-6, 6-4, 4-2. There was good news elsewhere for Canada as Erin Routliffe took the under-16’s title after beating Britain’s Katie Boulter 6-4, 6-3. Hyeon Chung of Korea won the boys’ under-16’s crown with his 6-7 (6-8), 6-3, 6-1 victory over Colombian Diego Pedraza. Only one American player remains in the 2011 Orange Bowl as the run of the Podzus twins came to an abrupt end at the quarter-final stage. Sachia Vickery is the last home player in the tournament after she overcame 14-year-old Russian Varvara Flink in a match that went right down to the wire. Wildcard Vickery lost the first set 6-2 but levelled things with a 6-3 win in the second. Both players failed to take a stranglehold on the match and went into a tiebreak third set which Vickery claimed 7-4. Her compatriot Samantha Crawford had the opportunity of guaranteeing a US player in the final but she couldn’t stop second seed Yulia Putintseva despite another three set encounter. The Russian had yet to drop a set and looked to be keeping that record intact when she edged the first set 7-5. Crawford hit back though and forced a decider with a 6-4 second set scoreline. However, Putintseva’s quality prevailed and she took the match 6-3 in the third. The intriguing tie between Dutch third seed Indy De Vroome and Estonian fifth seed Anett Kontaveit also went the distance. Kontaveit went ahead with a 7-3 tiebreak first set before the world number nine showed her worth and won 6-2 in the second. Her opponent had reached the French Open and last week’s Eddie Herr quarter-finals and thrived on the clay once again beating De Vroome 6-3 in the third to reach her first junior semi-final since July. Top seed Eugenie Bouchard’s passage into the last four was more elementary than the other quarter-final matches. She dispatched of seventh seeded Croatian Donna Vekic 6-3, 6-2 and the Canadian now stands alone as the only player not to have dropped a set thus far. There was less excitement in the boys’ draw as all the matches were concluded in straight sets but there was still shock provided by the exit of sixth seeded Belgian Julien Cagnina. Filip Peliwo, who’s been in good form leading up to the tournament, made it a Canadian in each semi-final draw with his 6-1, 6-4 victory. He’ll play Austrian Patrick Ofner after the seventh seed ended the dreams of Janis Podzus who took out Wimbledon finalist Liam Broady in the third round. Ofner had no mercy for his lowly-ranked opponent and crushed him 6-2, 6-0. The Latvian’s twin sibling Martins proved that brothers do things in synch by leaving the competition too. He made a fight of it in the second set against 12th seed Yoshihito Nishioka but the Japanese ultimately won 6-1, 7-5. He’ll contest his semi-final bout with top seeded Austrian Dominic Thiem, who never looked troubled in his 6-1, 6-1 demolition of Belgium’s 10th seed Kimmer Coppejans. All the scores and results for the boys’ and girls’ singles as well as the boys’ and girls’ doubles are available as drawsheets via the USTA website. The Podzus twins continued their excellent run at the 2011 Orange Bowl with both making it to the quarter-finals of a boys’ draw containing no American players. The Latvian pair are ranked well outside the top 1500 and Janis produced, perhaps, the biggest win of his career as he took out Wimbledon finalist Liam Broady in straight sets. 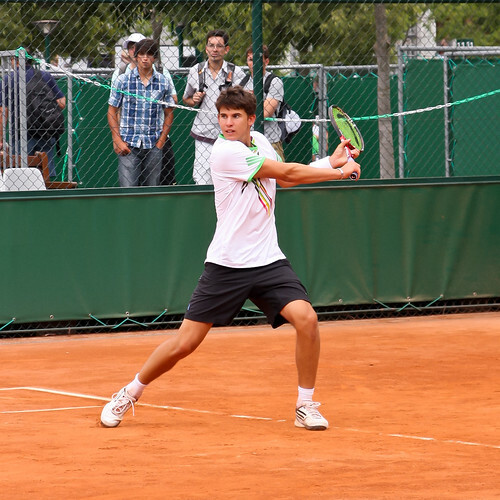 The 17-year-old won the first set on a tiebreak against the second seeded Brit and eventually the match 7-6 (7-5), 6-4 while brother Martins had to seal it in three with his victory over Germany’s Kevin Kaczynski. Martins faces 12th seed Yoshihito Nishioka of Japan following his hard-fought victory over Kai-Wen Lai and Janis will play Patrick Ofner next after the seventh seeded Austrian crushed wildcard Noah Rubin’s hopes of a quarter-final berth. Rubin had been one of two American players left in the draw but all are now gone as 13th seed Alexios Halebian lost a tight three set match to Filip Peliwo. The Canadian takes on sixth seeded Belgian Julien Cagnina in his last eight encounter. Cagnina was joined by fellow countryman and 10th seed Kimmer Coppejans after beating Borna Coric in three sets while top seed Dominic Thiem made light work of the lowest-ranked seed Hassan Ndayishimiye, coming out a 6-1, 6-4 winner. As the American boys fell, the girls thrived and created the possibility of an all-American semi-final match. Wildcard Sachia Vickery bounced back from a first set bagel at the hands of sixth seed Zuzanna Maciejewska to claim a shock win over the reigning Osaka Mayor’s Cup champion. She now has a great chance of making the semi-finals as her potential opponent Romanian fourth seed Ilka Csoregi lost. Russian 14-year-old Vavara Flink took total disregard of her age to claim her second seeded scalp of the tournament and Vickery should be wary as Flink knocked out home player Alexandra Kiick in the second round. The USA were already guaranteed at least one player in the quarter-finals as Samantha Crawford won the all-American third round tie against Nadia Echeverria Alam but faces a tough task with Yulia Putintseva her next opponent. The second seeded Russian kept up her record of not dropping a set so far as she took out Anna Danilina 7-5, 6-3 and is the only seeded player in the bottom half of the draw. In contrast, the top half consists of the first, third, fifth and seventh seeds who all won in straight sets. Indy De Vroome knocked out the highest-ranked player left from the United States as she beat 16th seed Taylor Townsend 6-4, 7-6 (7-5). It was a tough day for American tennis at the 2011 Orange Bowl with fourth seed Mitchell Krueger losing to qualifier Martins Podzus 6-3, 7-5 in the second round. The 17-year-old Latvian is ranked well outside the top 1500 in both the pro and junior circuits so his victory over the world number 13 is a big scalp. He was joined in the third round by his twin brother Janis who also qualified despite a similar ranking and beat 15th seed Stefan Vinti. Krueger and Vinti were just a couple of the big names to fall as Chinese eighth seed Xin Gao was crushed 6-1, 6-1 by Croatian Borna Coric and 11th seed Pedja Krstin came out on the losing end of an epic encounter. The Serbian won the first set against Greece’s Markos Kalovelonis in a tiebreak which went to 10-8 before getting narrowly beaten in the proceeding two. 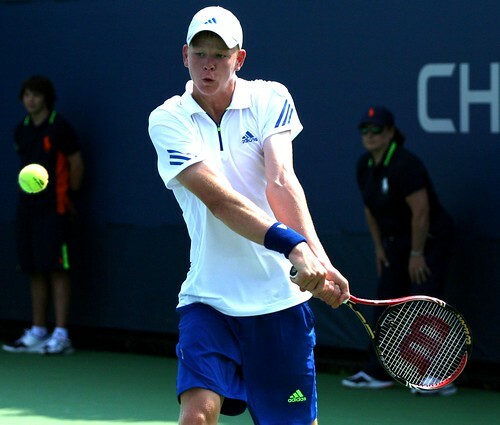 Fifth seed Kyle Edmund also left the competition but the Brit retired at 4-3 down to Kai-Wen Lai. Elsewhere, Canadian Filip Peliwo halted the run of home player Harrison Adams who earlier in the week beat third seed Robin Kern. There was some good news for America though, as wildcard Noah Rubin progressed along with 13th seed Alexios Halebian. Top seed Dominic Thiem battled back from a set down to beat Lithuanian Lukas Mugevicius while second seed Liam Broady won in straights. The bad news continued for the home fans in the girls’ draw as their top seeded player Alexandra Kiick lost in three sets to Varvara Flink. The 15th seed had been a set to the good but her Russian opponent hit back to win 4-6, 6-1, 6-3. 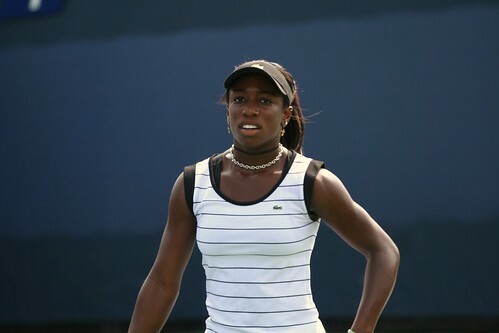 Stephanie Nauta, who caused an upset yesterday by taking out the ninth seed, exited along with her compatriot Jennifer Brady but hope can be salvaged as four Americans – including 16th seed Taylor Townsend – still remain in the draw. As the seeds fell in the boys’ event, the opposite transpired with the girls’. The top seven seeds all progressed in straight sets with no.1 seed Eugenie Bouchard only dropping one game. A full drawsheet for the boys’ and girls’ singles is available via the USTA website. The girls’ draw provided the most upsets on Day 2 of the 2011 Orange Bowl as last week’s Eddie Herr finalist Victoria Kan crashed out to Ukrainian Elizaveta Ianchuk 6-4, 6-3. The Russian 10th seed joined Kathinka Von Deichmann and Ellen Allgurin through the exit doors with many of the higher-ranked players making it through their opening exchanges. 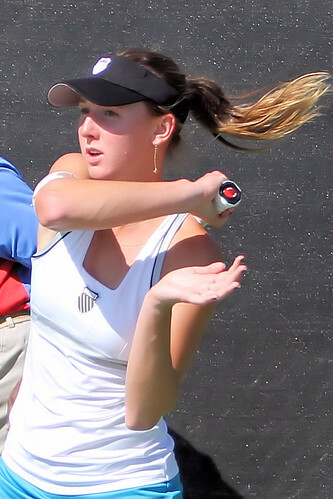 Liechtenstein’s ninth seed Von Deichmann had reached the semi-finals at the Osaka Mayor’s Cup in October but fell at the first stage here to American Stephanie Nauta. Swedish eighth seed Allgurin lost in similar fashion as wildcard home player Nadia Echeverria Alam dispatched of the US Open quarter-finalist in three sets. That’s where the giant-killing stopped. Top seed Eugenie Bouchard and second seed Yulia Putintseva secured straight sets wins while the two seeded American players also progressed to the second round. The boys’ draw had less talking points following Robin Kern and Karim Hossam’s exits yesterday. Germany’s Kevin Kaczynski defeated 14th seed Marco Aurelio Nunez of Mexico in the only upset. Title-favourite Dominic Thiem came through his match with Brit Luke Bambridge 7-5, 6-1 but Bambridge’s compatriot Liam Broady didn’t have it quite so easy. The Wimbledon finalist and second seed lost the first set before coming back to win 4-6, 6-2, 6-4. He’ll join American Mitchell Krueger (4) and fellow Brit Kyle Edmund (5) in round two.